On a rainy October morning, salon owners gathered at Five Senses Salon, Spa and Barbershop in Peoria, Illinois, for a community roundtable with U.S. Representative Darin LaHood (R-IL) on legislation he is co-sponsoring that would expand the tip tax credit to the salon industry. Currently, salon employers are required to pay FICA taxes on tips, even though the tip income is the sole property of the service provider and the employer is not involved in the tip transaction. In 1993, Congress granted the restaurant industry a dollar-for-dollar tax credit—now known as the 45(b) tip tax credit—on the employer’s share of FICA taxes paid on tip income above the minimum wage. In September, LaHood and U.S. Representative Suzan DelBene (D-WA) introduced H.R. 6736 (The Small Business Tax Fairness and Compliance Simplification Act), bipartisan legislation to update the current law to provide equitable treatment and administrative relief to salon and spa owners. In addition to promoting tax fairness, the legislation may improve tip reporting. Although nonemployer salons comprise 92% of establishments, their reported sales represent only 49% of total salon industry revenues, implying a significant underreporting of income in the nonemployer segment. This legislation includes two provisions which may reveal a valuable new source of tax revenues for the federal government by (1) allowing an Employer Tip Reporting Safe Harbor from an IRS tip audit if the employer practices proper tip reporting education, procedures, role compliance and record maintenance and (2) simplifying and coordinating income reporting between rental space owners and renters who provide professional beauty services. • “We are always looking to expand and grow in technology to be a step ahead, and an expanded tip tax credit would allow us to invest in technology, add services, expand the company and send bonuses out to employees,” says Nichole Corrington, owner of Capelli’s Salon in Decatur, Illinois. • “For us, a tip tax credit could mean the ability to hire 10 more people for our growing company,” says David Hands, franchise owner of 28 Great Clips locations in Illinois. 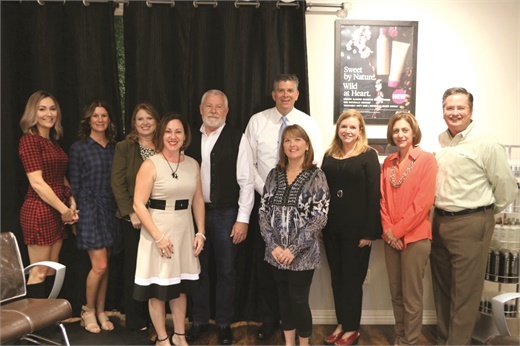 Congressman Darin LaHood (center in tie) hosts a community roundtable with salon owners and industry professionals to discuss the implications of legislation for a tip tax credit.